An adult Virginia rail wades and hunts for food at the edge of a marsh. Virginia rails find food by sight and their keen sense of smell, often probing in the mud with their long bills. With all the rain we’ve had in this very wet June, it’s not hard to wonder about Westborough’s native wetland wildlife. Some we might see rain or shine – the red-winged blackbirds, the ospreys nesting out on Mill Pond, and the muskrats, painted turtles, and snapping turtles. But other wildlife is so shy and secretive that we might never spot it, such as the Virginia rails that nest in marshes. Virginia rails (Rallus limicola) come north in the spring, like so many other birds, to nest in our area. They head for freshwater marshes where they disappear into thick stands of cattails and sedges to feed and nest. Perhaps you’ve heard the old expression, “thin as a rail.” It refers to these birds and other rails. Virginia rails have chicken-shaped bodies and are about the size of a robin, 9 inches long, but they aren’t as plump. Instead, they are narrow side-to-side, with a slenderness that helps them move easily among the tall, closely packed grass-like leaves of their chosen marsh environment. They also have an unusual claw-like hook at the bend of their wings that helps them climb and move in the cattails and reeds. What is a marsh anyway? It’s a wetland that has mainly leafy, grass-like plants, such as cattails and sedges. In contrast, swamps are wetlands with woody plants, such as large shrubs and trees. The freshwater marshes in our area are often at the edges of ponds or rivers. At the coast, salt marshes and tidal marshes with brackish water are common. Virginia rails prefer freshwater marshes, but they also use the other types. Once they’ve migrated here, Virginia rails don’t do much flying. They’re basically ground birds, although for them the “ground” is usually watery. They get around mostly by walking, wading, and running. They have large feet (as seen in our photo of a chick), which help them walk on floating vegetation, and very strong legs. They can also swim, dive, and use their wings to swim underwater – something they do to escape predators. This Virginia rail chick started off as a fluffy ball of black down but is now growing more adult plumage. 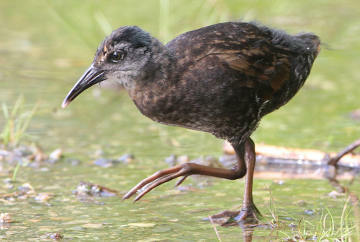 The rail’s large feet help it walk on floating marsh vegetation, and its long toes help it hold on to upright stems and leaves of marsh plants. These birds may build up to five nests, all well hidden in marsh vegetation. The nest is a woven bowl, attached to vegetation and close to the ground or slightly above the water level. The birds bend vegetation over the nest, making a canopy that helps to conceal it. They may also build a ramp from the nest rim to the ground. They end up using only one of the nests for their eggs, but they may use the others for resting or as extras in case something happens to the main nest. June is a great month for baby birds, including Virginia rail chicks. They hatch as little balls of black down. Rail chicks can see as soon as they peck their way out of their eggs, and they can walk, run, and swim by the end of their first day. They are not as helpless as most of our songbird chicks, which often hatch naked and blind. Yet Virginia rail parents still care for their chicks, feeding them, helping keep them warm, leading them around, and protecting them. What is there to eat in a marsh? Virginia rails prefer animal food, which means insects, larvae, snails, caterpillars, earthworms, and small fish. They probe for food in the mud with their long bills. They are unusual among birds because they have a keen sense of smell, which aids their search. Virginia rails aren’t easy to spot, but the best place to glimpse one is at the edge of a marsh, where one might briefly venture out to look for food. It can be somewhat easier to hear Virginia rails, which make clicking and grunting sounds. Likely places to find them are large marshes in places such as the Mass Fish & Wildlife management area and the state hospital land on the north side of town. 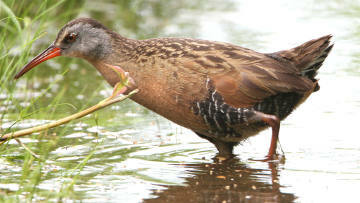 Another rail, the sora (Porzana carolina), often shares freshwater marshes with Virginia rails. Soras are about the same size, but they don’t directly compete because they eat mainly plant food, such as seeds and wild rice. Soras also prefer somewhat wetter parts of the marsh than Virginia rails. They make an eerie chime-like whinnying sound. If you are lucky enough to spot a rail and aren’t sure which one it is, remember that soras are gray-brown with black on their faces and short yellow bills, while Virginia rails have long red bills and reddish wings and breasts. The main threat to these rails is not hunting, but rather, habitat loss as freshwater marshes are lost to development or polluted. The next time you pass a marsh or notice some of its more obvious life – cattails, bulrushes, red-winged blackbirds, muskrats, turtles – think of the secretive Virginia rails and soras that may be raising their chicks there.